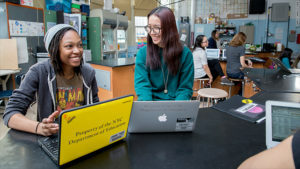 Girls Who Code Clubs are free after-school programs for 6-12th grade girls to use computer science to impact their community and join a sisterhood of supportive peers and role models. Since there is no equivalent program for boys, they are welcome to join GWC as well. The program is designed for students with a wide range of computer science experience, including girls with zero knowledge to students looking to build on their existing skills. The club is facilitated by Maria D. Chang, research scientist for Cognitive Computing for Education at the IBM Thomas J. Watson Research Center. Our next Girls who Code club and registration date will be on October 1st, 2018 at 4:30 pm. This will be a 12 week club that meets every Monday (except Columbus day) from 4:30 to 6 pm in Tech Central at the Riverfront Library. Call Christine Bitetti at 914-337-1500, x490 for more information. Meet Maria D. Chang, our facilitator for Girls Who Code.